Between sterile and fertile corms no difference. They are upright, simple, rarely branched in whorls, dark green to gray-green, up to 6 mm thick, have a 8-34 dull or sharp ribs. Leaf sheaths mostly closely appressed to the stem, to 15 mm long, whitish at the base and top with wide dark green ring. Strobilus brown, pointed at the top. Hollow stems, mainly wintering green, rarely die, occur in dense clod. Noticeable are small variations. It grows in wet forests, forest clearings, on the banks of rivers and streams, on sandy and clay-sandy soils. It is found in many forest communities, where often overgrown area of a few square meters. It’s represented in Europe, western and central Asia, Siberia, Caucasus, China, Japan and North America. From dichotomous branched, thin, underground stem (rhizome) developed in parallel sterile and fertile corms. Sterile were 10-60 cm high and 1-4 mm thick, around of half, they are densely double or triple whorls branched. Their leaf sheaths at the bottom of greenish, reddish towards the top, with teeth that have coalesced into 3-4 lanceolate lobes. Fertile corms of 10-50 cm high and 3-5 mm thick. Side branches long and thin, whorls branched, with reddish, lanceolate teeth. Strobilus are 15-25 mm long. 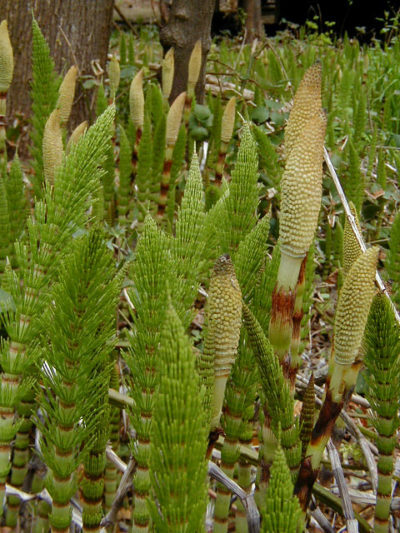 It grows in moist shady woods, the openings forest, the peatlands, mostly in the mountainous region. There is often in dense populations over large areas. This species covers a large part of Europe, northern Asia and North America. Rhizome hairy, develops deep in the ground. Sterile corms 10-20 mm thick, hollow, mostly single-branched in whorls, with 20- 40 low ribs, with 25 mm long leaf wrappings, which are at the bottom of the bright, in the upper part with 20-40 dark lance sharpened teeth whose thread-like terminals and fall off easily. Fertile corms up to 15 mm thick, juicy, unbranched, light yellow, with up to 4 cm long leaf wrappings, which are extended upwards like a bell. They appear before the sterile corms. Noticeable are small variations. 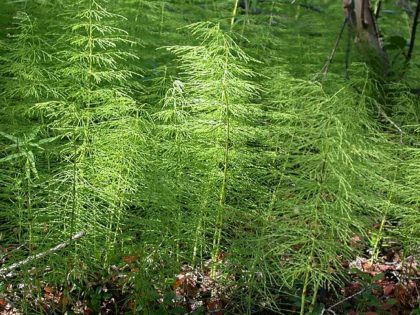 It grows on forest swamp lands along the banks of a mountain stream, with ditches, embankments of roads and railways, on loamy soils. It occurs most often in dense populations. Prevails the countries of Europe, western Asia, northwestern Africa, western North America and the North Atlantic islands. 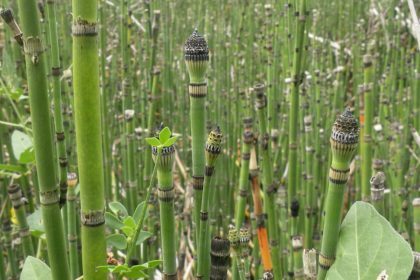 The above ground part of the sterile stems, known as the drug Herba Equiseti maioris, finds application in medicine as an excellent remedy for urination.